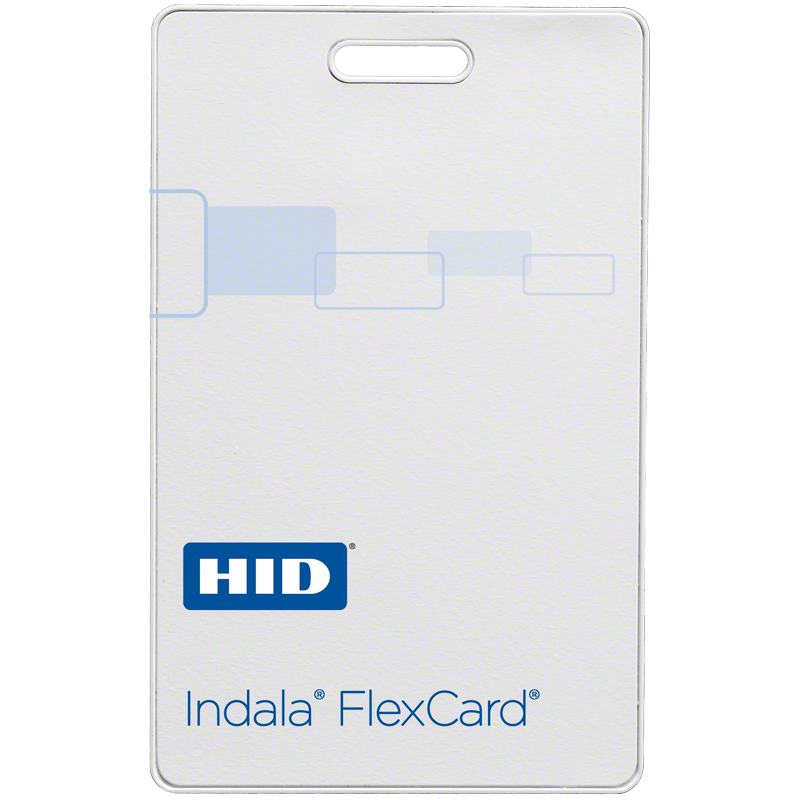 HID's Indala® FlexCard® standard clamshell card is "credit card" length and width, features beveled edges, and can accept photo-flap and direct-print adhesive-backed ID badge overlays. The durable ABS card construction makes Flexcard a good choice for warehouse, factory and university applications. The Indala FlexCard can be programmed in the factory or in the field using the Indala ProxSmith® Programmer and Toolkit with Wiegand, magnetic stripe and serial data formats. Indala's FlexCard can be used interchangeably with other Indala credentials on most systems and can be ordered with specified facility codes and ID numbers. HID Indala's competitively priced FlexCard delivers the number sequence ordered with no gaps and with no under or overruns. 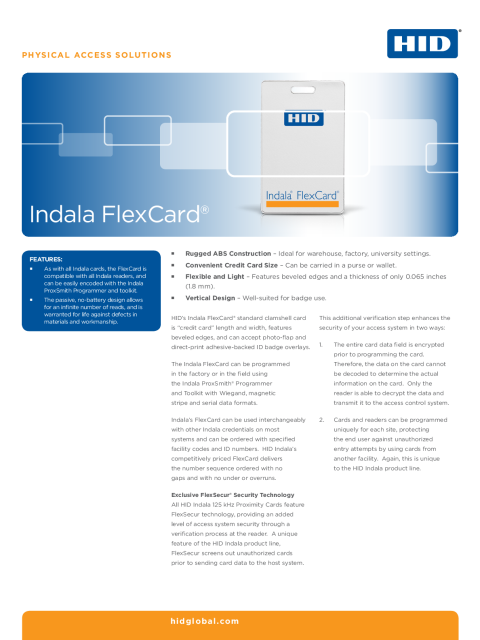 All HID Indala 125 kHz Proximity Cards feature FlexSecur technology, providing an added level of access system security through a verification process at the reader. A unique feature of the HID Indala product line, FlexSecur screens out unauthorized cards prior to sending card data to the host system. As with all Indala cards, the FlexCard is compatible with all Indala readers, and can be easily encoded with the Indala ProxSmith Programmer and toolkit. Rugged ABS Construction - Ideal for warehouse, factory, university settings. Convenient Credit Card Size - Can be carried in a purse or wallet. Flexible and Light - Features beveled edges and a thickness of only 0.065 inches (1.8 mm). Vertical Design - Well-suited for badge use.